Ukraine has potential to significantly increase food output. Once called breadbasket of Europe, Ukraine’s soil’s agri-ecological potential is only used for 40 percent. The EBRD and the World Bank called in May 2009 for new government policies to help boost investment in agriculture in Ukraine and so unlock the huge potential the country has to increase farming output. At a conference on agribusiness one day after the EBRD’s annual meeting, organised together with the Ministry of Agrarian Policy of Ukraine, the two institutions said the current high food prices were a major opportunity for Ukraine, a net grain exporter. Ukraine is one of the few countries in the world that are in a position to significantly increase grain net exports. Private investment in the Ukraine’s farming demand sound and transparent policy but also appropriate infrastructure and investments in public goods. Infrastructure challenges include physical capacity of railway networks, ports, the road system as well as storage. More investment needed in sustainable agriculture research as well as sustainable technologies training and eduction of farm managers and agronomists. 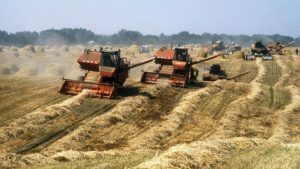 A shift in policies and increases in private and public investments could help Ukraine to increase its grain production, possibly to as much as 70 million tons (from around 35 million tons in recent years). The increased production of grains would largely translate into increased export potential of Ukraine not of net grain alone but also semi-finished and finished food products of premium quality. * Establish a veterinary and food safety control system compliant with EU regulation and invest in the certification infrastructure that would give Ukraine access to the European market. * Supporting an effective policy dialogue involving the private sector and government officials at different levels. * Devising targeted social assistance programs for the rural poor and those affected in particular by rising food prices. The EBRD is the single largest investor in the agribusiness sector in the region where it operates. Its involvement in the agribusiness sector spans all activities throughout the production chain, from farming, processing and trading to food distribution, packaging and retail. In 2007 the EBRD invested ?520 million in the agribusiness sector and expects to invest roughly the same amount this year. Most recently the EBRD provided a $20 million loan to Ukraine’s agribusiness group Astarta, to support its drive to put into operation equipment to achieve higher energy efficiency at its sugar production plants as well as in sugar beet farming operations. The World Bank has invested over US$ 5.5 billion in Ukraine since 1992, with around US$ 677 million of commitments in the agricultural sector. It has also provided extensive analytical and advisory services in the sector to help remove obstacles for increased competitiveness. Against the background of the global food crisis, the World Bank prepared a policy note entitled “Competitive Agriculture or State Control: Ukraine’s response to the global food crisis”, highlighting opportunities for Ukraine to benefit from the current situation on international markets, whilst mitigating the social impact of higher food prices at home.